Are you suffering from hair loss? Perhaps your hair has become thin over time. 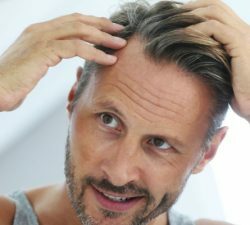 If so, you are not alone, as approximately 30-50 million American men and women experience some form of male or female-pattern baldness. Thus, with strong scientific evidence in promoting the growth of new hair and increasing thickness, Platelet Rich Plasma (PRP) treatments represent a non-surgical approach to scalp hair regrowth. By harnessing the power of growth factors and bioactive proteins found in one’s own blood, Dr. Benjamin Stong personally administers PRP treatments at his exclusive K Spa, located in Atlanta. As mentioned, PRP therapy utilizes a patient’s own blood. Thus, following a standard blood draw, the tube of blood is placed in a centrifuge machine. The machine spins the blood until red blood cells are separated from the blood plasma. The plasma is then re-injected into specific levels of the scalp, near the hair follicles. The process requires great precision, as injections are meticulously placed at every half-inch over an area of thinning hair, as described by Allure online. Even so, the rich blood plasma signals the production of new cells and prolongs the growing phase of the hair cycle through a high concentration of platelets being delivered at once. In addition, the plasma aids in collagen production and the repair of blood vessels. With this in mind, however, individuals report varying results, and this depends on several factors, reported by The Cleveland Clinic. First, hair loss that is recent tends to respond better to PRP treatments. Second, those with thyroid disease or lupus may not experience great results, and are typically not the best candidates for PRP therapy. Similarly, those taking blood thinners may not see dramatic results, as their blood platelets are not as effective. Without question, those experiencing hair loss or thinning hair needn’t look further than The K Spa in Atlanta. With double-board certified plastic surgeon Dr. Benjamin K. Stong at the helm, patients know that they are receiving the highest standard of Platelet Rich Plasma treatment for hair regrowth possible. Call today to experience hair restoration at The K Spa, the first of its kind in Atlanta.